I signed up for a pinterest account back in January at some point. I figured I should find out what all of the buzz was about. Then, almost seconds after I created the account, I got off of there as fast as I could! I could tell that it was going to be another time waster. And at least, with Twitter, I’ve followed some people who always lead me to news articles and information that I’m interested in. Today, I stumbled across this article: How the Wall Street Journal Uses Pinterest. This reignited my curiosity about Pinterest, and I headed over to do some pinning. Pinterest was even so successful at distracting me that I never got around to following the Wall Street Journal, even. I started making a board. Lately, I’ve been bitten by the spinning bug. I had been spinning up some roving last fall when our full wedding preparation time hit us. The spinning got dropped, and then I was so busy with my new job that I never picked it up again. I finally finished that yarn a couple of weekends ago, but haven’t wound it off the bobbin yet. Spinning it up made me want to go on Etsy and purchase a whole bunch more hand dyed wool to spin, even though I have plenty of natural colored wool in my closet. Here is my Pinterest board, “Pretty fiber & handspun yarn“, filled with hand dyed fibers and some handspun yarn that I found while “window” shopping in etsy shops. 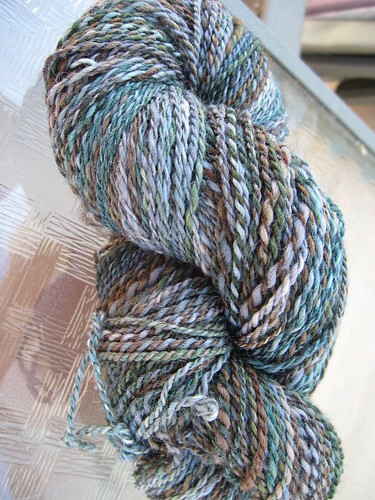 I even added a couple of my own photos of yarn I spun last summer, though I don’t have the photography skills to get the color accuracy and beauty that my favorite etsy sellers can get of their stuff! As I get more time for crafting again, I suspect that Pinterest will be a very nice platform for sharing crafts. I imagine it would be a very useful way to sell crafts, too, especially if you have great photos of what you’re selling. I should make a board for all of the patterns I want to knit. Oh wait, that’s called my Ravelry queue. Hm. So much going on online, so little time! It’s funny the reactions I get from non-knitting and non-fiber people when I tell them I’m going to a sheep and wool festival. One of them was, “Wait, you’re not like, dressing up as one, are you?” That’s why I feel lucky to have Chris, who, while not a knitter, spinner, or any other kind of fiber geek, was still willing to be dragged along to the fiber fest. He was excited to see llamas, bunnies, and appreciates merino wool outdoor clothing. 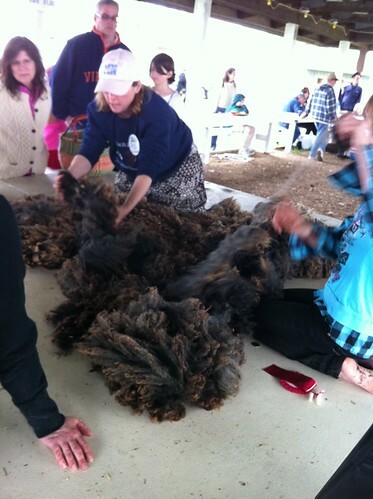 Last weekend (May 7-8th) we went to the Shepherd’s Harvest Sheep & Wool Festival in Lake Elmo, MN. 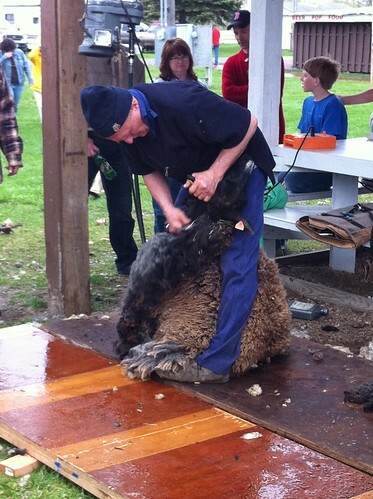 I did some shopping, and we checked out the stock dog demos, sheep shearing, and fleece skirting demos. The fleece skirting demo was actually really informative, and she gave a lot of tips for handspinners who want to buy a fleece and wash it themselves. That was good for me, because I bought those fleeces at the fiber rummage sale awhile back! I’ve been waiting for it to get warmer and sunnier before venturing into the fleece washing world. I’m re-instituting the post a day goal. I’ve been majorly slacking, but I’ve got plenty of content. Tomorrow I teach the second installment of my community ed knitting class, and I’ve got some stuff to share related to that. Today was a very full day. Despite a couple of inches of snow that we woke up to Friday morning, it’s starting to smell like spring around here. Most of that snow, and the accumulated snow from all winter, is all melted away now, and it was 44 degrees today! 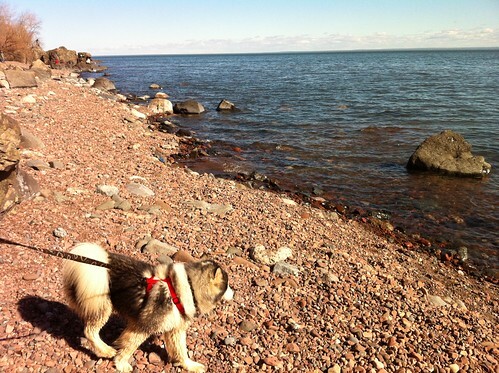 Yep, that’s right, in Duluth, when it gets to be 40 degrees, we all crawl out of hibernation and do things outside like take walks by the lake and wear shorts. Well, I myself do not wear shorts, not even in the summer, but other people were. Anyway, this morning started with a fiber rummage sale. I wouldn’t have even known about it if Chris hadn’t spotted a sign on the side of the road! The fiber rummage sale was held in the Duluth Art Institute’s building in west Duluth. It’s an old vine-covered brick building that used to be a library. It’s awesome! I grabbed up a whole bunch of fun stuff. 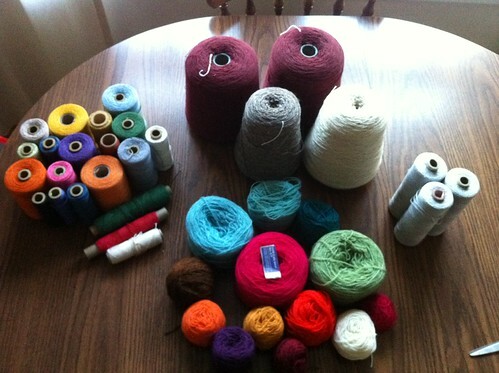 Various types of yarn. Big cones of wool, smaller cones of cotton, one of which is labeled as “rug warp,” balls of “weaving wool,” and three things of linen yarn. I’ll probably weave more scarves with the wool. I got the bag of cotton yarns because I’ve been wanting to try out tablet, or card weaving. I got the book Card Weaving by Candace Crockett last year and then later happened across a pack of pre-made cards for it, so I’ve been wanting to try for awhile. 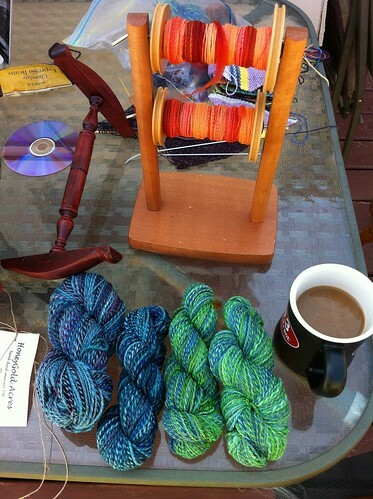 Inexpensive random yarns from a rummage sale seem like just the thing to practice with! 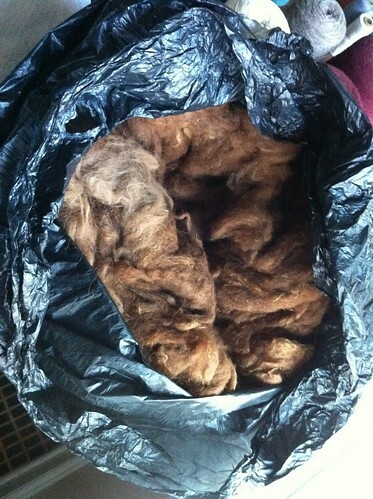 The first one is labeled “raw wool” and the second is alpaca fleece. They both need to be washed and processed before becoming spinnable, but I decided this will be a learning experience. 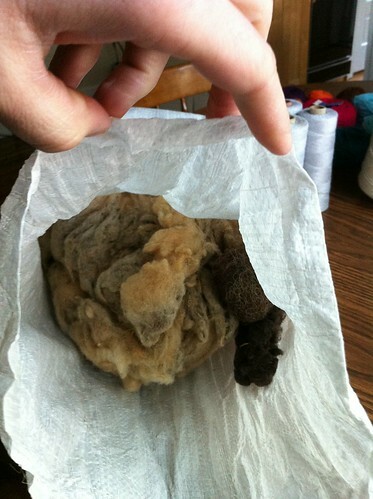 I figure that there’s a high chance that there won’t even be any very good, usable wool in that $3 bag, but it was a $3 bag of wool! It’ll be a good summer project to learn to wash and process it. I have high hopes for the alpaca, too. It’s full of VM, or vegetable matter, but already feels super soft. After our short stint at the fiber sale, we went out for lunch, then ran home and got the pup for a walk. We went down to Canal Park and walked him on the lakewalk. We discovered that he likes going in water. Many huskies do not. Gru made many friends, human and canine, on our very long walk today. He’s so pretty and then when people approach him he flops right into them to get pet, so he’s a charmer. We couldn’t have asked for a better dog. All in all, a very nice sunny Saturday.